How did you get involved with VMX Paul? Used to ride in the 70’s,(no clubs) on a RM. I went to Collie VMX about two years ago. 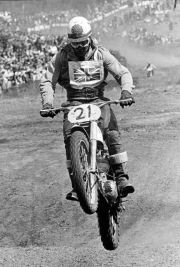 As its pre70 feature today what make of that era would you ride and why? Side pipe CZ. CZ in my blood it’s the first bike I had in the 70’s. What do you enjoy about VMXWA race meetings? Atmosphere, mechanical help, friendly like an extended family. Scariest moment? Last meeting at Narrogin, second jump down the straight I ended up doing a super mono, heading towards a tree in 3rdgear. Corrected myself and still got a third! Best Success’s Paul? Medallion at Dandaloo Classic for “most persistent”. And for the last question Paul, what’s the mode of transport are you attending VMX in? I spent a lot on that van over there, all decked out. I came over from Pinjarra.